Opportunities and challenges in the energy market to drive an effective clean energy transition and boost the renewables energy investment in Morocco. 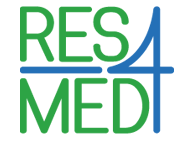 RES4Med&Africa is organizing a high-level Business-to-Government (B2G) business “Moroccan Breakfast” workshop focused on “Opportunities and challenges in the Energy Market to drive an effective clean energy transition and boost the renewables energy investment in Morocco”. 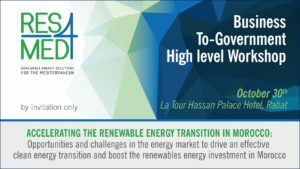 The workshop aims at presenting the opportunities and challenges for driving an effective clean energy transition and fostering the investment from the international private sector, putting together the most experienced and international companies within RES4Med&Africa network and the most relevant Moroccan stakeholders. The workshop will cover many aspects of the renewable energy (RE) sector, with a special focus on the MV market liberalization; in this perspective the workshop will also be the occasion to disseminate the outcomes of the study “Accelerating the development of Renewables on the MV market in Morocco”, carried out by RES4Med&Africa in collaboration with Poyry. Since its nature for RES4Med&Africa of being a private-public platform, the workshop will be an important occasion for a proactive dialogue with the local institutions, the most relevant stakeholders of the Moroccan market and the international companies within the RES4Med&Africa network, playing a pivotal role in the Moroccan market.